The hills, so grateful for the rain clouds that they hug them close to the ground, breathe a huge sigh of relief. 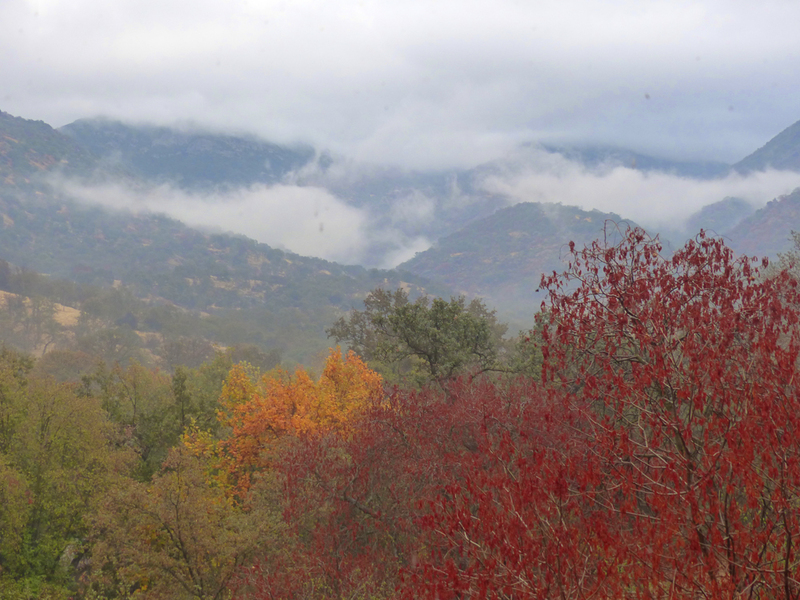 I watch the cloud embraces move and shift from my living room window on this Thanksgiving morning. The buckeye tree with it’s rusty colored leaves says hello. The sycamore tree below, near the creek, intensifies its brilliant yellow with the rain. And, blue oaks, standing firm with their green leaves, can now bring forth an acorn crop after a deep rain drink. I am reminded that the earth has not forsaken us. All the days to come offer possibilites for humans to return the favor. Happy Thanksgiving and full moon and sun moving into Sagittarius today…expand gratitude in all directions, led by love. This entry was posted on November 22, 2018 by Elsah in Change, Every day.